In Part I of our message on Energy, we focused on the types of positive energy that can help sustain our efforts to reap an abundant harvest in the important areas of life. Things that do not have a “Finish Line” like family relationships, our health and well-being, and the legacy we leave behind. We also described the reality that we do not have an unlimited capacity of energy, so we need to ensure we maximize the positive and minimize the amount of negative energy in our lives. Today’s message is about negative energy and how we can minimize its impact in our lives. There are some common sources of negative and unproductive energy that we need to address as we continue to build and strengthen our character. It would be a bit disingenuous for any of us to say we do not deal with negative or unproductive energy from time to time. Today, we are going to shine some light on a few problem areas, in the hope that we can more effectively deal with them. Below are a few common sources of negative and unproductive energy. Worry: Many of us struggle with worry in a number of areas. We worry about our family, work, finances, war, etc. Many of these things are big and important. Also, we probably worry about the not so big and important things like how we compare to others in our personal and professional lives. Worry can be a significant source of negative energy in our lives. Sustaining high levels of worry is unhealthy and needs to be addressed. The best path to minimizing worry in our lives is to focus our efforts on controlling what we can control and begin to take action. If we are worried about a close relationship, just sitting there and worrying about it is not an effective choice. Begin by making a modest plan and start working the plan. Even if the relationship is too damaged to speak directly with the other person, we can still make steady progress simply beginning to think and journal about the struggle. Eventually, we will build up the courage to take the next step. We can effectively replace the negative energy around worry when we take a positive step towards addressing the concern. We don’t need to take big, bold steps; small steps in the right direction are all we need to put some positive energy into a difficult situation. In addition, history is a great teacher, if we are willing to learn. The vast majority of things we worry about never happen. Anger-Bitterness-Resentment: I could break these three apart, but they have a tendency to travel together. We typically hold onto these negative feelings when someone did something to us or said something to us that we felt was unkind, unjustified, or was the truth we were just not ready to accept. In addition, sometimes we become envious of someone else and these three negative feelings follow on the heels of envy pretty consistently. Although we may be pretty good at rationalizing our way into these feelings, the reality is that they result in an unhealthy level of negative energy and need to be addressed. Below are three ways we can minimize the negative energy around the feelings of anger-bitterness-resentment. As with most things, the easy, low risk path often returns the smallest rewards. The more difficult, high risk path most often returns the greatest reward. We all have our own tolerance for balancing risk and reward and the choice is ours alone to make. (1) Ignore: “Shake it off” or let it roll off you like “water off a duck’s back.” This is the easiest path to take and like most easy things, returns the smallest reward in terms of minimizing negative energy. However, it is a good step in the right direction. (2) Forgiveness: This is where things get tougher. Genuinely giving up our perceived right to “get even” and hurt someone back can provided us with a solid boost of positive energy as we clear the issue from our plate of activity. Eliminating the negative energy around the grind of “getting even” or stewing over the misdeed through forgiveness, can free up a tremendous amount of capacity for positive energy to replace the void. Forgiveness involves a little more risk, more effort, and returns a potentially bigger reward. (3) Grace: This is the most difficult of all steps. Basically, grace is going out of our way to be kind, considerate, and a blessing to someone who we feel hurt us. This takes a great deal of effort and it more often than not, produces the greatest rewards. Demonstrating grace is the biggest game changing step to take any relationship in a positive direction. It has an exponential effect on the amount of positive energy within an individual and an equally significant impact on reducing or eliminating negative energy when we have been hurt. Demonstrating grace is not for the weak or faint of heart and the rewards, measured over the long journey of life, are unmatched in building healthy, strong relationships. Lost: Most of us lose our way from time to time. Whether we are on the highway towards a new vacation spot or on the proverbial “highway of life,” we get lost. In both situations, we spend a great deal of unproductive energy wandering around when we could be more productive with our energy if we took some time to figured out where we are and where we need to go. There are a few simple, but often underutilized steps to minimize this unproductive energy drain and free up capacity for more positive energy. On “the street” searching for a destination: (1) Ask for directions much sooner than we have in the past (2) Instead of yelling at our travel companion, we should ask for their help. They bring a different perspective from their seat and at this point, a different viewpoint may help (3) When in doubt, upgrade the software on your GPS. On the “highway of life” searching for a destination: Spend some quality time figuring out where you really want to go, make a plan, and then make decisions to start heading in that direction. Spending the time upfront is critical, but so few people actually do it. Einstein is quoted as having said that if he had one hour to save the world he would spend fifty-five minutes defining the problem and only five minutes finding the solution. We should use a similar construct as we determine our life’s destination. Where do we want to go…spend some time thinking about it. Then buckle-up and head on down the road in that direction. As we take steps to maximize the amount of positive energy and minimize the negative energy, we will build and strengthen our character and Character Creates Opportunity® to achieve our goals and strengthen our relationships. I received some positive messages on last week’s blog about how the spring season can help reinforce the principle of the law of the harvest and encourage us to plant some seeds in areas we want to grow. Also, most people in the country are actually starting to see a little of spring which I think is lending some support to people’s enthusiasm. In southwest Michigan, we are actually seeing some grass for the first time this year. In today’s blog, we have Part I of a two part message where I want to focus some thoughts on how we can channel a level of energy necessary to sustain our efforts towards reaping an “abundant harvest.” Personal sustainability can be defined as the ability of a person to hold firm and endure in the face of a variety of forces that could compromise their health and well-being. We all can probably relate to the experience of starting a project well, but somehow not seeing it to completion. For most routine goals in work and home, like closing the financial books at the end of the month, delivering a presentation, taking a vacation, or cheering on a child at some sporting event, these goals have a definite finish line. On most occasions, we can find the strength to wrestle down these goals and get them done. There are plenty of well-researched methods by some very bright people that could help us all more effectively work through some of these “quit looks good” moments. I would encourage you, as I do so myself, consult a number of resources and speak with others to help strengthen our resolve in the tough times in life. My attempt is to not review a large number of resources, but to simply provide one area of focus that has been proven to be a good preventive measure to take to help minimize the number of “quit looks good” moments we encounter with the really important things in life. We only have so much energy in our universe. I do not want to go into the details of the 1st and 2nd Laws of Thermodynamics (my engineering professors at West Point would be laughing at the very suggestion that I could instruct others on the concept). Suffice to say, we have some natural limitations on the amount of energy we can possess. We can eat better, exercise more, sleep better, etc. and gain some additional capacity, but our personal energy is not unlimited. Even our favorite motivational speakers or fitness gurus need some down time when they are not on stage. Therefore, one critical choice we can make to improve our sustainability in the journey to reach our full potential is about our how we manage our own personal energy. We all know the feeling when we are in a state of positive energy (as Dr. Mihaly Csikszentmihalyi described in his seminal work Flow: The Psychology of Optimal Experience and as Shawn Achor described in The Happiness Advantage). When the conversation and the connection is easy and fun with loved ones, the feeling of a “runner’s high” when we exercise, the positive thoughts we have during a reflective moment after a job well done, the times when we really do “count our blessings,” and the seemingly boundless energy of a small team of entrepreneurs working towards building “the dream.” That type of positive energy is what we want to focus our efforts on. It lasts longer, it gets easier to create more of it as we develop the habits to cultivate it, and we strengthen our sustainability to keep moving towards our own “abundant harvest” in the important things in life. Given that we have natural limits on our energy, in order to create capacity for more positive energy, we need to minimize the amount of negative energy we create and minimize the amount of unproductive energy spent. This is where our Character Creates Opportunity® to maximize the positive and minimize the negative and unproductive use of our own energy. Please tune in for Part II of this message where we will discuss some of the common sources of negative energy and importantly, what we can do to minimize them in our lives. For residents in most parts of the United States and Canada, we all welcome spring after a long, challenging winter season. However, like most difficult struggles in life, when they pass, we all reach a greater level of appreciation for a warm spring or a more comfortable season of life. As springtime begins to slowly creep its way into our days, we hear more birds chirping, the sun shines a little longer, and we all seem a bit more hopeful during this change of season. As we continue to build and strengthen our character, the coming of spring is one of the most encouraging times of the year. The coming of spring reminds us of the one fundamental natural law that most directly translates into a relevant, practical, and universal pathway of truth to accomplish our hopes and dreams: The Law of the Harvest; simply, you reap what you sow. The law of the harvest is the most simple and most powerful life transforming principle. Ironically, it is also the one that we need a consistent, steady reminder of its simplicity and power during the twists and turns of our life’s journey. The law of the harvest, in the natural world, is as true as the law of gravity. If we want to reap an abundant harvest of corn or cotton in the fall, there is only one pathway to follow: The Law of the Harvest. If we asked any farmer 2,000 years ago or one today in the fields of Iowa, we would get the same general response; There are no shortcuts to an abundant harvest. We must spend time in the winter to make a plan, make decisions, and make preparations to implement when the spring comes. In the spring, we must prepare the ground and plant the seed. In addition, throughout the spring and summer, we must cultivate the fields through a long growing season. Then, and only then, will we reap an abundant harvest in the fall. There is no way to take a short cut. We cannot vacation in the spring and summer and then jam an entire growing season into September. There is no way to pay for the “Speed Pass” lane on the farm and there is no “Easy” button. The natural law of the harvest will always be our judge. Just like the law of gravity governs our eventual return to the ground no matter how high we jump, the law of the harvest governs our ability to produce our most essential food sources for life. In addition, the law of the harvest governs our ability to accomplish our most personal hopes and dreams. If we want healthy relationships with those closest to us, the law of the harvest will be our judge. Did we make a plan and decide to act? Are we planting seeds and are we continuing to water, weed, and monitor progress? If we are not, we will not reap the harvest of a healthy relationship. There is no short cut to building a healthy relationship. A nice gift of chocolates, spending one night in good conversation, or occasionally relieving a loved one of doing some undesired, but necessary chore will help momentarily. However, if there is not a consistent effort applied to cultivate the relationship throughout the seasons of life, the relationship will not have the lasting health to reap an abundant harvest. Also, in the workplace, there is no short cut to effective leadership. Intentional planning, decisions, and actions must be consistently applied. The character of a leader must be seen consistently over time. Employees don’t give their full engagement to the cause of the organization because of one great motivational speech or one great leadership retreat. Employees get engaged when they see their leaders consistently setting the example, engaging them in their efforts, and supporting them to achieve their piece of the organization’s objectives. Furthermore, in our own personal development, the law of the harvest will always be our most steady path to lasting growth and accomplishment. If we want a more fulfilling career path, then we need to be intentional about making a plan and working the plan. If we are expecting someone in “management” to come and spoon feed us a fulfilling career plan, we may be waiting for a long time. If we want to maintain our physical, mental, emotional, and spiritual health, we need to make the plan and work the plan. Lasting health is built over time. It is not an overnight success. Just as on the farm and in our own lives, we do our best to keep moving forward through an unforeseen tragedy and we persevere with our own unique ways of coping through the upcoming winter season. 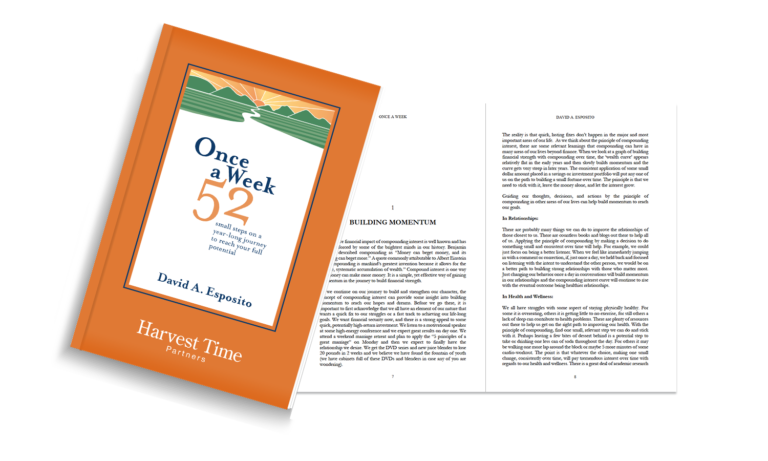 Then, with the return of the next spring, we have another season of opportunity to start again and more often than not, the law of harvest will go our way in the next season on the farm and in our lives. If you missed your chance on a New Year’s resolution to make a change, I would encourage you to use this spring and the reminder of the law of the harvest, to plant some new seeds, cultivate them throughout the spring and summer, and fully expect an abundant harvest in the fall. This time of year, with the freshness of spring, has always seemed to me to be a better time to start something new than a dreary, dark January anyway. Let this spring be a season of opportunity to support and encourage our efforts to apply the law of the harvest to achieve our goals. As we become intentional about living according to the law of the harvest, we will build and strengthen our character and Character Creates Opportunity® to achieve our goals no matter what our present circumstance. There has been a great deal recently written and discussed on the topic of loneliness. Most of you reading this blog have been “around the block” a few times and can most likely relate to the reality that all of us walk through periods of loneliness in our lives. Prior to the last decade or so, the topic of loneliness was never discussed around the dinner table, in the classroom, and rarely even mentioned within the confines of traditional religious services. There was very little authentic sharing of one of our most common human experiences of being in the dark valley of loneliness during certain points in our lives. Regardless of whether we believe the topic is open for discussion or not, the reality still exists that we all have felt terribly alone at certain points in our lives. There were those school-age experiences of when the best of friendships became strained or a ‘first love’ ended or never actually got started (those of us who were rejected in the school hallway can relate to that reality). There was perhaps a time when the choices we made caused us to fall out of favor with the ‘cool’ group and we felt all alone. The quiet struggle of dealing with being away from home for the first time in a dorm room at college, a cold hard bunk-bed in basic training, or some other place that removed us from the comforts of home brought us into the valley of loneliness. We do not escape the periodic grip of loneliness as adults either. The times of strained and broken relationships with those closest to us always seem to result in a feeling of loneliness. In the journey of marriage, all of us (it is not an exaggeration to say 100% of us) have walked through a period in our closest relationships where we have felt absolutely all alone even when we have someone sharing the same bed with us. In the workplace, falling short of some performance goal or being an ‘outlier’ on the lower end of some performance grid can bring us into a very lonely spot. The ‘politics’ still present in many organizations can result in us feeling left out of the ‘cool’ crowd and all alone just like in grade school. Even in the ‘golden years’ of life as senior citizens in retirement, the feelings of loneliness are sometimes even more present. As children and grandchildren progress through new experiences and quite often a very busy season of life, grandparents can feel a huge sense of isolation and loneliness. We could devote a significant amount of time to this topic as 10,000 baby boomers each day in America will reach the age of 65 for about the next 20 years. The occasional pep talk of just “get motivated” is a good one and may just be the snap-back to reality we need to get us back on track. However, for most people, if it were that easy to snap out of it, they would, and often do give themselves the ‘halftime motivational talk’ and keep moving forward without anybody ever noticing their own internal struggle. The unfortunate reality is that sometimes the shadow of loneliness grows long and it takes a more intentional effort to overcome. In the book, The Sun Also Rises, by Ernest Hemingway, there is a scene when Mike, one of the main characters, is asked how he went bankrupt. He responded, “Two ways. Gradually, then suddenly.” When I speak to adults about the topic of loneliness, I see essentially the same description. A small infraction in a relationship that is first ignored, then another comes along, then another, until a major event triggers a bankruptcy in the relationship and the very real sense of being all alone in the dark valley of loneliness sets in. The next steps are the real tough ones. In our most struggling times of loneliness, we need to (1) resist the desire to think only about ourselves and (2) move with compassion in service of others. Compassion is defined as a desire to alleviate the suffering and burdens of others. We should make the choice to lift our eyes off ourselves and turn to those around us with compassion and a desire to serve. We will soon realize that one of the major benefits of serving others is the light on our own personal struggle becomes strangely dim. Below are just a few ways we can work our way more effectively through a period of loneliness by serving others. In the workplace, consistently passing along sincere words of encouragement to hard working coworkers or stepping up to help someone else deliver on a major project are a few practical ways to move with compassion and serve others. In the home, when the feelings of loneliness creep into our closest relationships, we need to overcome our natural desire to “go to a neutral corner” and move forward to directly, with sincerity and humility, meet the needs of the one where the relationship is strained. We need to rebuild the connection with compassion to serve rather than be served. Making a decision to move with compassion to serve others will build and strengthen our character and Character Creates Opportunity® to move efficiently out of the valley of loneliness and into healthier and stronger relationships, especially with those closest to us.